Remain under Control Retrievers used as gun-dogs are trained to remain under control sitting calmly and quietly until sent to retrieve. 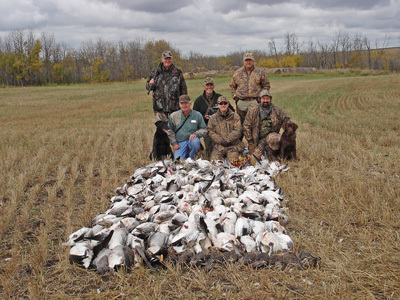 Mark downed game Marking is the process of watching for a falling bird or multiple birds. When the command "mark" is given the dog should look up for incoming birds and remember where each bird falls. 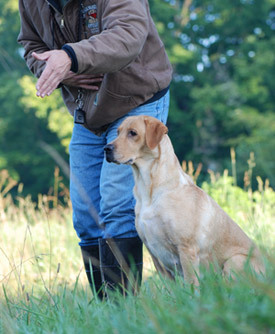 Perform a Blind Retrieve A blind retrieve is sending a dog after a bird he has not seen fall. The handler sends the dog out to retrieve the bird, guiding the dog with the use of a whistle and hand signals. Delivery*Once the dog has completed the retrieve it should gently but firmly hold the bird until commanded to release it to the handler’s hand.